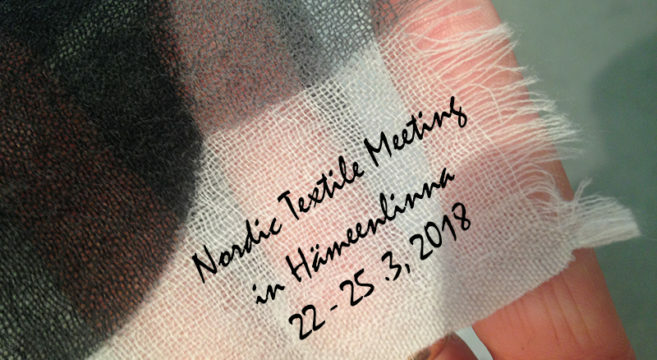 NTA håller sitt årliga nordiska textilmöte den 22 – 25 mars 2018 i Hämeenlinna i Finland. En mötesplats för medlemmar i Nordic Textile Art där vi vill skapa nätverk, samarbetsytor och nya möten genom konstnärlig praktik. Praktiskt skapande föder nya idéer. Fokus under dessa dagar ligger på workshops, handens kraft och konstnärliga möten. Anmälan är öppen 12.12 2017 - 22.2 2018. You will find information and fees in the application form here. You will find the program in English here. Och programmet på skandinaviska här. Dinner - Inkala Herrgård (Fredrika Wetterhoffs barndoms hem). Present yourself with a “conversation piece”. Wearable art – wearable conversation. Workshop 1 - Rya – Rug handknotted. In this workshop you will learn how to knot a Finnish ryijy - rya (rug) Material is included. The rug is in size of 70 x 35cm and the yarn is wool (Tuukka yarn) one needle and a tool (lasta) is included. You can also continue and finish the rug at home after the workshop. You will have an instructor from Wetterhoff company. Workshop 2 – Fabric Printing – pattern, pattern, pattern. A workshop with block prints in graphical black, colour combinations and experimental layers. Workshop leader Margareta Heijkenskjöld Holmgren. Material is included. In this workshop you will learn the basic knowledge of the industrial design and weaving process. You will make a scarf in wool which also will be felted in a washing machine. (2-3 different structures to choose) You don’t have to have any specific knowledge of weaving. Workshop leader is Arto Laine and his company Tate-Team Ltd/Al-Monityö. Arto is specialized in industrial weaving and he has unique long history and knowhow in weaving. This industrial textile mill is the only industrially weaving mill in the Nordic countries where the designers can produce even shorter meters of fabrics together with a professional team. In this workshop “Drawing with fire” you learn to know the basics of this great technique that gives so many new possibilities to textile artists to create new things. You will get the instructions for this workshop of Lecturer and Designer Aija Lundahl. We read while you do your embroidery. We will read Tove Jansson in Finnish, Swedish, Danish, Norwegian, Icelandic. You bring your own embroidery or use our materials. You can come and go during the day. Textile is power - Practical creativity breeds new ideas. It´s time to meet again. Four days of networking and workshop time together. 22 - 25 March in Hämeenlinna in Finland. Open for members of Nordic Textile Art. Come and join us! Workshop 1 - 80 € Rya - handknotted. Guided Industry tour - costs for bus ride and visit are included in the conference fee. All eating - everyone pays for themselves at the restaurants. Where to stay: Hotel Emilia (mention NTA for reduced price).